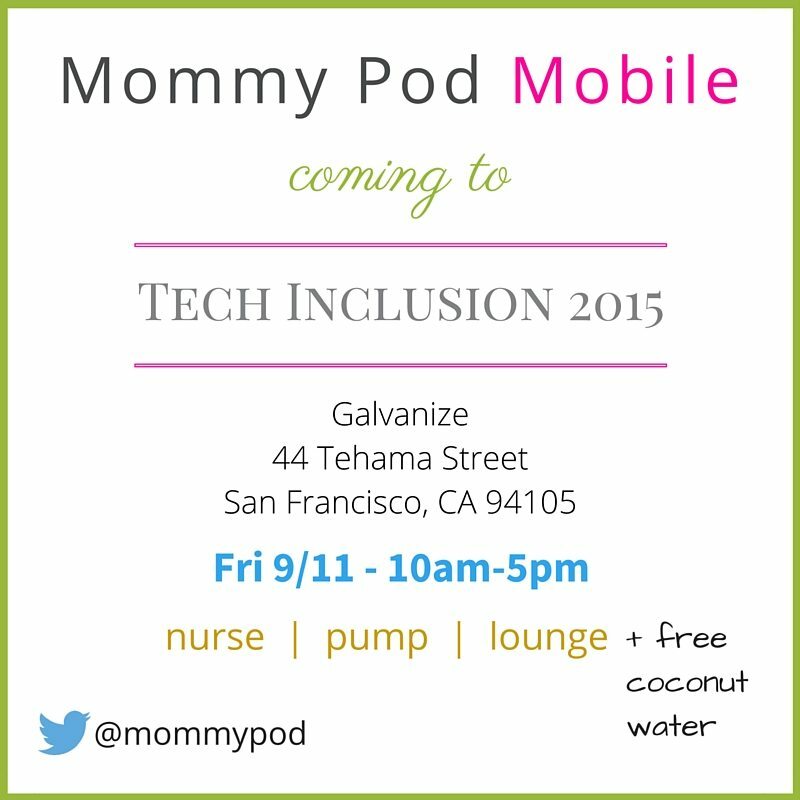 The Mommy Pod Is Coming to Tech Inclusion! Yes, this is kind of a rant. Because we have a real problem. And at the end of this post you’ll find an invitation to participate in an experiment that might help working women who breastfeed their babies at professional conferences. Fact 1: Breastfeeding is one of the best things a mother can do for her infant. [Over 1 bajillion reasons listed here] In fact, doctors generally recommend that mothers breastfeed their babies for at least 1 year, and exclusively so for the first 6 months. Fact 2: More than half of first-time mothers who work through their pregnancies return to their jobs within 3 months of giving birth. Fact 3: Our work culture does not support breastfeeding. Save for a few federal laws affecting companies with more than 50 employees, working moms everywhere else who need to pump are pretty much SOL. The ability to pump at regularly intervals. If breastfeeding moms don’t express milk throughout the day, their breasts become painfully engorged and their milk supply goes down. The ability to pump in a clean, private space. This space must be shielded from other people and, ideally, it’d have an electrical outlet for the pump. Bonus points if it’s not a stress inducing one, because it’s always easier to express breast milk when you’re relaxed. But the sad truth is that many workplaces lack these basic accommodations, so many women stop breastfeeding once they return to work. THIS, in spite of overwhelming medical evidence supporting the benefits of breastfeeding. THIS, in spite of 81% of women in the U.S. becoming moms by age 44. THIS, in spite of national handwringing over decreasing labor participation rates by women, perennial freak-outs over the women leadership gap due to non-existent funnels and leaky pipelines, plus widespread panic over our country’s growing skills gap in the face of intense, globalized economic competition. Man, I’ve pumped breastmilk in some sketchy places. I must say, however, that my #WorstPlace2Pump story involved my pumping in a room where there was visible, albeit dried blood on the ground. It was shortly after I’d returned from maternity leave for the birth of my first child, and I was attending a large conference at an even larger conference center, with my black pump bag and computer in tow. Upon inquiring with several conference staff members about the availability of a private space in which to pump, I was offered the ladies room. Would you prepare food for your family in a public bathroom? So then why the hell would I pump breast milk — food that will be consumed by my infant(!) — in a place where crappy things — like literally — happen on the regular? Trust that minds are blown when companies go above and beyond to make it easier for working moms to pump. I’m talking about dedicated lactation rooms furnished with the basics PLUS hospital grade pumps, comfy chairs, and sinks and microwaves for sterilizing equipment. I even know some that provide a tool for booking rooms online in advance. (Thank you, Galvanize, for making your lactation rooms reservable online for your members!) No doubt, these companies know this is a great way to support women in their workplace — a meaningful gesture that enhances their ability to recruit and retain top female talent in today’s competitive marketplace, where the typical cost of replacing an employee is 21% of her annual salary. But trust, also, that this type of mind-blowing isn’t happening at most workplaces, let alone at professional conferences where breastfeeding mothers are technically “working”. While we’ve got a long way to go in making American work culture friendlier toward women who become mothers — a long-term endeavor that requires changing hearts and minds, I think we ought to begin tackling at least one piece of the problem: providing the physical infrastructure to make clean, private, and — dare I say — nurturing spaces for women to pump breastmilk. I, along with my friend Anica John — a new mom who currently pumps breast milk for her infant son — have been working on something we call Mommy Pod Mobile, an experiment that we’ll be running on Friday, September 1, the first day of the Tech Inclusion 2015 conference. What this entails is Anica and I rolling up in a borrowed RV that we’ve transformed into a sanctuary for women who need to pump on the go — a prototype of a pop-up lounge that’s furnished with free coconut water, electrical outlets, and Spotify in the background. We’ll be parked outside in front of the conference from 10am-4pm, eagerly awaiting visitors from the current and former breastfeeding mom set. 1. Please come check us out if you’re currently breastfeeding your baby or have done so in the past. 2. Please help spread the word by sharing this post with women you know who work near the conference and are either breastfeeding or have breastfeeding experience. 3. Please share your pumping horror stories with us @mommypod using hashtag #WorstPlace2Pump. 4. Please sign up for our email list to get news and updates about this experiment. We hope you’ll join us in taking this first step toward finding a solution to help more working mothers succeed in the workplace! And if you’ll be at the conference on Saturday, please come catch me at the Moms in Tech panel so we can talk about this issue and more. THANK YOU, you awesome people, you! We’re grateful to you, Melinda Briana Epler (@changecatalysts) of Change Catalyst and Wayne Sutton (@waynesutton) of BuildUp — the genius organizers of Tech Inclusion 2015 — for giving us the opportunity to run this experiment. We’re grateful to you, Locke Berkebile, for being down for the cause and lending us your RV. We’re grateful to you, Galvanize, for hosting the conference, and for earnestly supporting diversity and inclusion efforts. I’m looking at you, Ryan Nadeau (@RyGuySF)! And though they don’t know it, thank you Raina Kumra (@rainakumra) and Jessica Jackley (@jessicajackley) for inspiring this idea after I learned of Jessica being turned away from TED Women, and then Raina’s offer to help organize babysitting at next year’s conference. And lastly, thank you to my friends Anica John (@Anica_John) for being crazy enough to try this with me, and Alex Tran (@alextran) for brainstorming with me that fateful morning in Seattle when I asked the question, “How might we help mothers who attend professional conferences?” You two are always on point and I’m so grateful for your friendship and brilliance.